As a former editor and writer for the national media (including for The New York Times, the Village Voice, New York magazine, Details, Entertainment Weekly and a dozen others) who has switched sides and now does PR for businesses and commercial artists, I educate my clients about how the media works so they understand the why behind what I do for them. As a follow-up to my previous piece on the subject -- The 10 Commandments to Perfect PR for Your Business - I present here a case study on how those tenets of effective PR were applied on the ground and produced the kind of game-changing, global media coverage that enabled a client and his endeavors to reach their maximum potential. Vivot - a highly trained and skilled men's hair stylist from Paris, France - moved to New York City in 1999 and made a name for himself as the director of the men's division at Paul Labrecque. He set out to open up his own men's salon, eponymously named Martial Vivot Salon Pour Hommes, located on tony West 54th street in July, 2008. A large PR firm was hired for the launch. In the first 6 months the firm produced exactly one piece of press for the salon. Outside of the catastrophic failure of that campaign, the fact is that the incredible media potential of Martial Vivot Salon Pour Hommes simply wasn't enough to self-generate the media it needed to survive and thrive in competition with gold standard unisex salons like Garren, Frédéric Fekkai and John Frieda vacuuming up all the media space and John Allan cornering the men's hair salon niche. 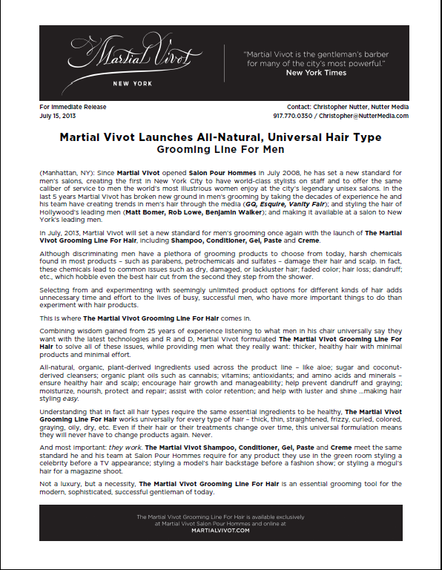 Nutter Media was brought on to relaunch Martial Vivot Salon Pour Hommes' PR operation in December, 2008. The first thing I did was come up with a story in the press material that would answer these challenges. 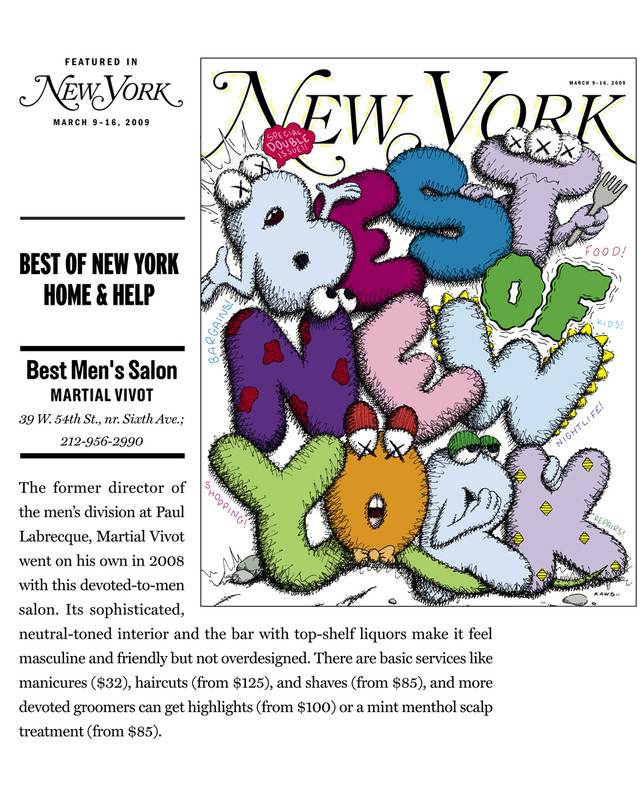 I positioned Martial Vivot Salon Pour Hommes as the first and only men's salon in New York to have-world class stylists on board and to provide service on par with the gold standard unisex salons...in other words as the Garren, Frédéric Fekkai or John Frieda for men. 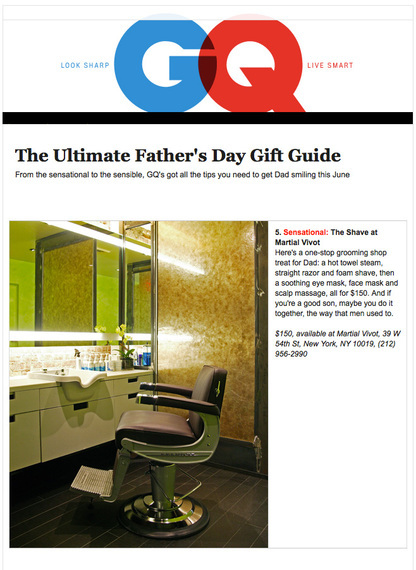 This positioning also solved the problem of Martial Vivot Salon Pour Hommes being in media competition with the city's other men's salons that rely exclusively on "masculine" trappings like pool tables or "metrosexual" services but have no stylists of note on staff, aka. blinged-out barber shops. 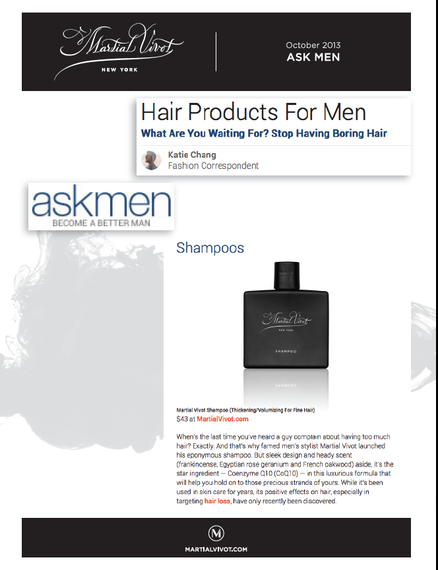 I then designed a precise, up to date, made-to-measure media list tailored to the needs of the salon - targeting the big, high profile men's magazines as well as major mainstream New York City media that cover men's grooming, culture and store openings. Knowing that editors at in 2009 were already deluged with electronic correspondence I assembled physical press kits (as well as an online version) to be sent out by messenger which would include personal phone calls and emails from me and, when appropriate, an invitation to come into the salon for a haircut with Martial himself. The PR campaign for Martial Vivot Salon Pour Hommes was relaunched in February, 2009. Like with any PR campaign with no already-famous name attached (outside of his lead stylist, Losi, who is a legend in the business), the response from the media was crickets at first. It didn't help that the media didn't how to pronounce his name, so I had to say it clearly into voicemails and spell in phonetically in letters and emails: Marcy-al Vee-vowe (as distinct from the default American interpretation Marshall Vee-vott). 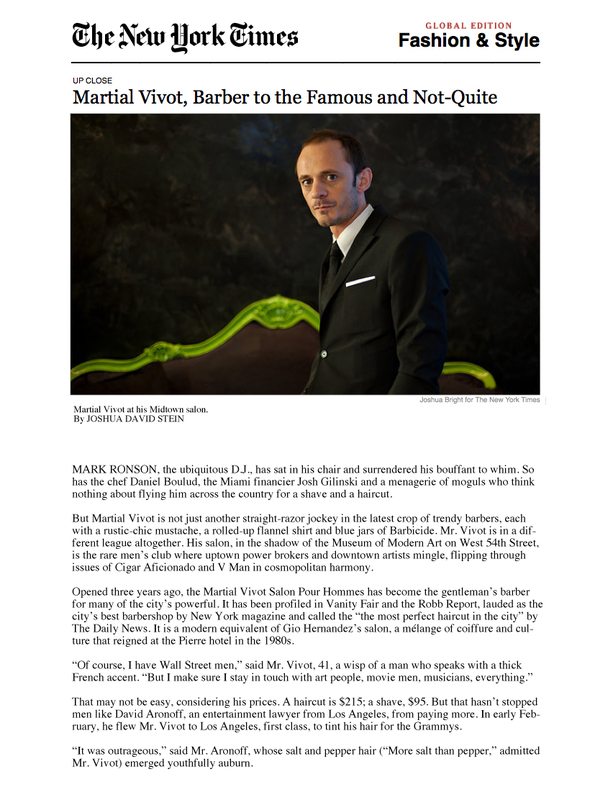 Eventually, several editors and writers took me up on the haircuts...and that's when the media first fell in love with Martial Vivot and Salon Pour Hommes. When they all walked out looking ready for the Oscars' or Grammys' red carpet, and they got a first person experience of what truly a high style, high fashion but old world gentleman's hair salon was really like - along with the story that I gave them to help them understand what they were experiencing - Martial Vivot's media magic was born. First came a Best Men's Salon nod from New York magazine which took care of Google SEO challenges because at that point any search for "best men's salon in New York" would bring up that item up as the first search result. This was followed by a small but powerful tidal wave of interviews, expert quotes, best men's salon titles and profiles in GQ, Details, Out, Robb Report, BlackBook, Time Out New York, Manhattan magazine and Gotham, to name a few. An ongoing gig styling the hair at the Michael Bastian shows via a fashion editor I got into Martial's chair then produced press about the models' hair. A year of intense and focused campaigning resulted in a profile of the salon on Vanity Fair's beauty blog, which wrapped Martial Vivot and the salon in the kind of gold-standard media prestige that would warrant what was, at that time, a $215 dollar men's haircut and $95 dollar straight-razor shave. If you've been in Vanity Fair, your haircut and shave are worth that much. The media coup de grâce came exactly 2 years after the PR launch when The New York Times Global Fashion and Style Edition did a major league profile of Martial Vivot and the salon - courtesy of a freelance writer I had put into Martial's chair several times. Martial Vivot Salon Pour Hommes was officially on the map. PR mission accomplished. In 2013 the price to sit in Martial's chair was up to $320, the staff had doubled from 3 to 6, the reception area had to be converted into 3 more stations for stylists and I spent at least half of my time receiving media inquiries. That year Martial joined forces with beauty R and D genius Melissa Jochim - famous for creating major natural beauty brands such as Juice Beauty - to formulate a line of hair products for men in order to expand his now famous brand. So I now had my second launch on my hands. And it would take place in a context of the new PR elephant in the room -- social media. 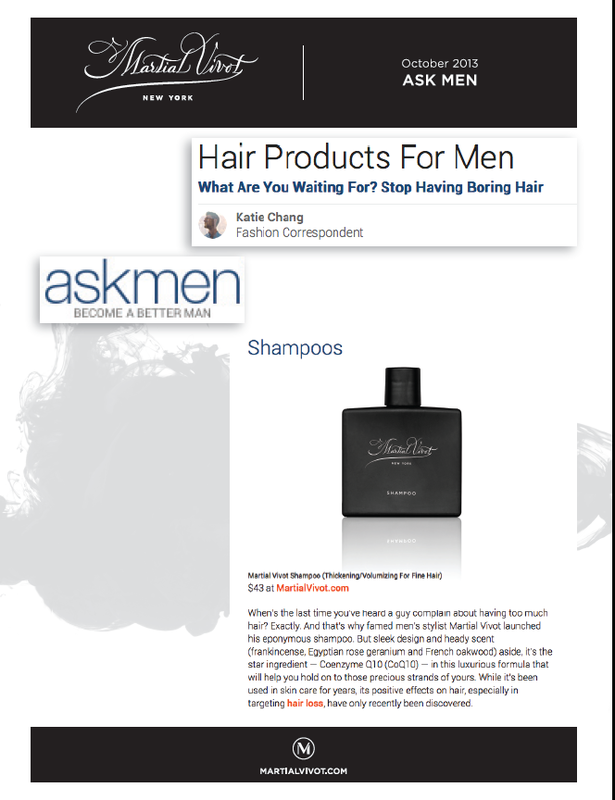 The distinct advantage of going into this launch was that Martial was now established as the leading expert in the media in all things men's grooming. And I did not have to spell his name phonetically to anyone anymore - it was like Hermès, which you either know how to pronounce correctly, or you don't, and if you don't it is your problem. That said, the PR curve was still steep. To begin with, the tiny, boutique brand sold exclusively by the salon -- and I -- would be going up against all the major global mega beauty product brands - Revlon, Garnier, Kerastase, Redken, Paul Mitchell, you name it - including their big PR firms, their big PR budgets, and the fact that, often as advertisers, they would get first dibs. The features of the product line could have communication problems as well. The line would be all natural, which could be read as effectiveness taking a back seat, and one product would fit all hair types, which could be interpreted as low-end. Branding presented another problem - the product line didn't have a name. Whatever I came up with, I knew it needed to be based on Martial's brand and communicate masculinity without being trite. My solution: The Martial Vivot Grooming Line For Hair. For those in the know, "grooming" is green room code for, basically, men's hair and makeup. "Grooming" is an industry term that connotes masculinity without saying it and that also steers clear of "beauty", while also suggesting it. The media list for the launch was mostly taken care of, although it had grown dramatically because I received new media inquiries every week. 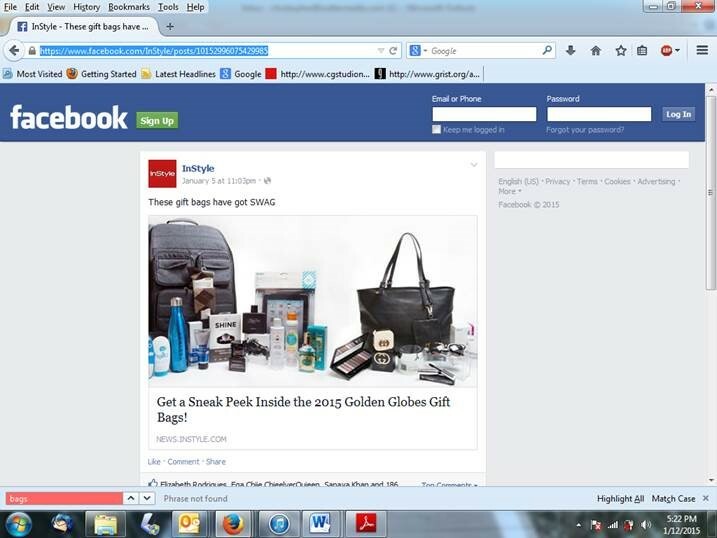 The only realm I had to add was media that covered new beauty product launches. 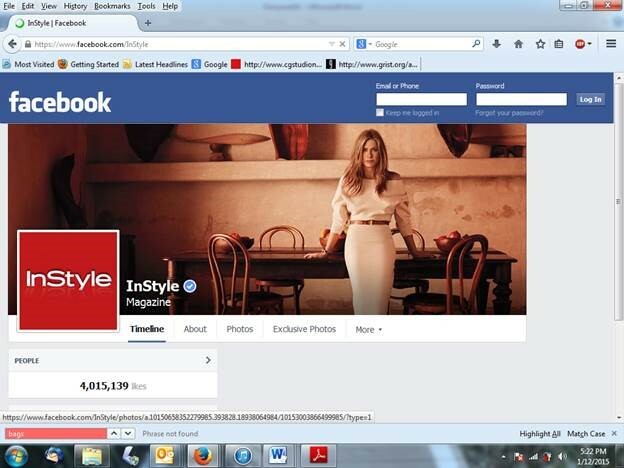 But, like with the salon launch, the initial emphasis would be on A-List media - ie. the really hard-to-get media - because the prestige bestowed upon Martial, the salon and the products was necessary to bolster the price points. It's also important when it comes to building the PR operation for any client to target what the client's demographic reads, and Martial Vivot's demographic reads Vanity Fair, the Times, GQ, Esquire and the like. And once you're in A List media everyone else comes to you. As far as the social media equation of the PR operation for The Martial Vivot Grooming Line For Hair and, by extension, Martial Vivot Salon Pour Hommes were concerned, rule #1 was to not go about it like everyone else was going about it, ie. getting dragged down into amateur-hour endless spam in the form of "generating content" that nobody cares about and is nothing but a giant boondoggle. This is what the vast majority of PR firms are recommending today, and it produces exactly zilch for their clients, as well as making their clients look unprofessional in the process. In Martial's case, it would be easy for someone to "like" a post about the salon or his products -- or, worse, a post that has nothing to do with either, like photos of food and cocktails and messages like "Happy Friday". It's another thing entirely to inspire his demographic to pay top dollar for these products and services. Rather, the strategy was to simply use Martial's social media venues as just another means of professional communication with the media and the public, and to make sure that all posts were as sophisticated as the salon. This meant developing a professional editorial "voice" for Martial's social media venues; connecting Martial's social media channels with the social media handles of my media list to get two-way communication going; being partners in the co-promotion of the media's stories to improve their numbers; and letting the national media with their huge social media reach promote Martial on their venues, ie. borrowing their gargantuan numbers. To the end of using social media to inspire Martial's clientele to pay top dollar for his goods and services, my strategy was to rely on A List media to make those recommendations to the public, and to use Martial's social media venues to broadcast those recommendations to his clientele. To wit -- "Happy Friday" is not a professional, media savvy post. "Men's Fitness' sultan of style Barret Wertz recommends the Martial Vivot Gel to help you stay put together all night at that chic black tie holiday party. Click here and do everything Barret says!" is a professional, media savvy post. Mechanically, this was a much more demanding launch. After all, I had to send out bags and bags of samples along with intricate press material. To that point, any publicist who tells you that a product launch can be Instagrammed is just trying to get out of the doing the labor of sending out samples from a product line because the beauty media simply have to be able to use it, see it, smell it and hold the products in their hands. This time the media deluge was instant and coverage included, to name just a few (and some of them several times), T Style, Vanity Fair, W, WWD, Details, Esquire, GQ, AskMen, Yahoo! Beauty, Manhattan, Men's Fitness, People, US Weekly, InStyle, Food & Wine, Departures and Allure. And because all this media was electronic, and the media always hyper-linked to the salon's site, buying the products was only a click away. As planned, social media took care of itself. These media outlets as well as the writers themselves all promoted the stories on their channels with tens of thousands, hundreds of thousands or millions of followers. 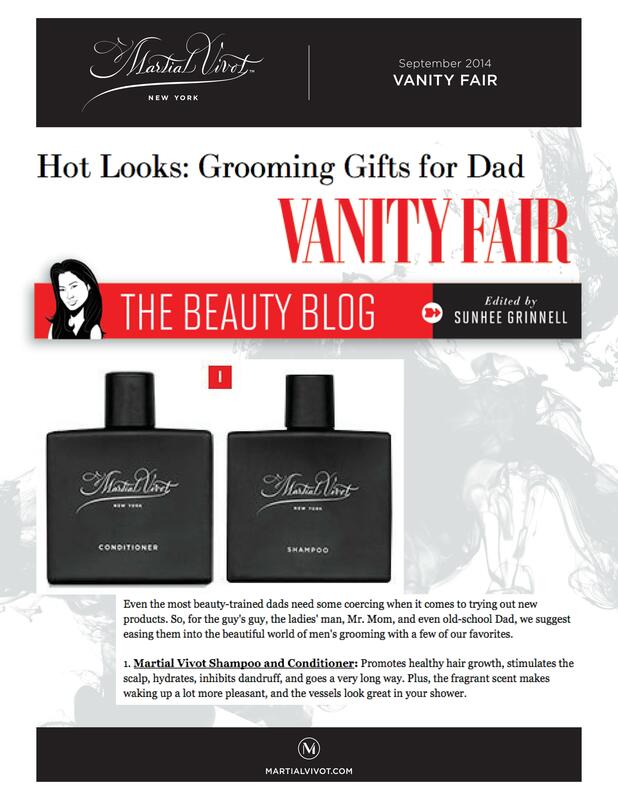 However, the social media coup de grâce for The Martial Vivot Grooming Line For Hair occurred when the Golden Globes people read about the product line in Esquire and called and asked me if we would be interested in having the Shampoo in the Official Golden Globes Ceremony Gift Bag For Men in 2014. As a part of the deal I negotiated with the Globes, they, along with their media partners InStyle and People, would promote the Martial Vivot Shampoo on their social media channels, adding up to a social media reach in the multi millions that year and the following year when they used the Shampoo again. InStyle also linked to Martial's site, driving the kind of major traffic a small, high end, boutique salon could never get on its own. 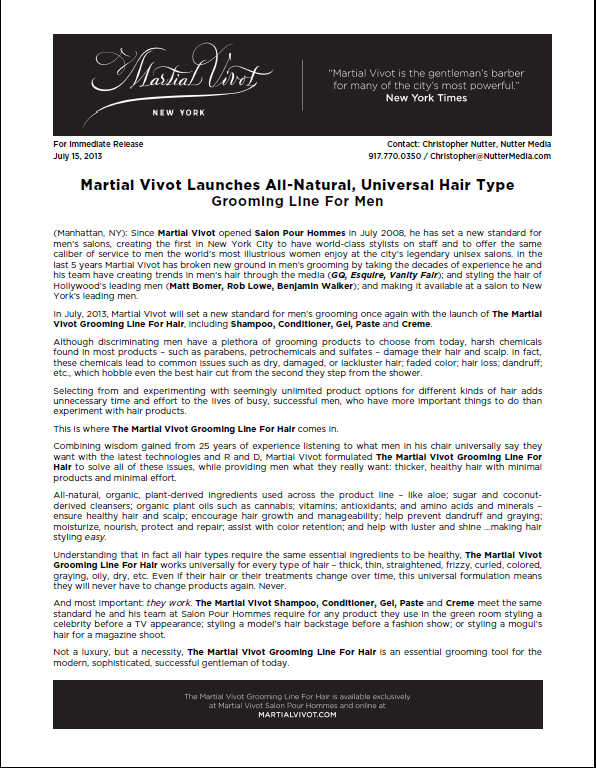 Today, Martial Vivot Salon Pour Hommes is established as the premiere men's hair salon in New York; The Martial Vivot Grooming Line For Hair has been exposed to millions of people through traditional media, new media, and social media, included in major A-List Hollywood Swag Bags, and is sold at Barneys New York's around the country; and Martial Vivot himself is the undoubtedly the most famous men's hair stylist today. And this is the job of a good publicist - to use the media to help your client's ventures reach their full potential. As I wrote in The 10 Commandments to Perfect PR for Your Business a bad publicist can be like a shady mechanic -- they keep your operation in a cloak of mystery because it isn't about doing the job; it's about making the money. So if you are interviewing a publicist and they show you whom they represent and how much media they get, ask them how they did it. A good publicist will tell you. But a lot of publicists take on clients who are already well-known and take credit for the media coverage -- and they won't answer the question because they weren't actually responsible for it. A good publicist is all about transparency, putting the client first, giving the media the story they need and, above all, treating the media and the client with respect which, if you're lucky, will be returned. 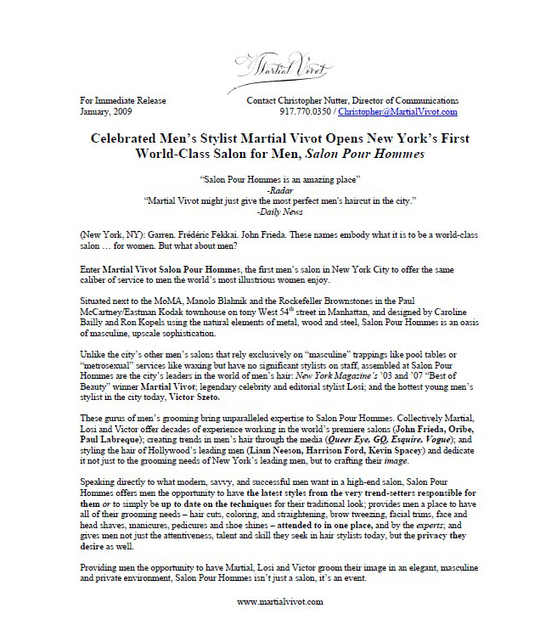 A large PR firm was hired for the launch of Martial Vivot Salon Pour Hommes in 2008. In the first 6 months the firm produced exactly one piece of press for the salon. What was missing in the press material? The story on the salon. What did the original publicist rely on instead? Cliché’d PR buzz words like “luxury” services and “metro men” that, obviously, didn’t sell.